Today sees the launch of a new report from Terrafirma. The Terrafirma Ground Report is a ground risks and liabilities report that includes an expert professional opinion, risk assessment and risk transfer on all potential ground risks. The 25th Edition of The Law Society Conveyancing Handbook includes new guidance supported by the experts at Terrafirma, on Mining and Natural Ground Perils. To ensure solicitor due diligence, the new Terrafirma Ground Report satisfies the new Law Society guidance and ensures compliance. 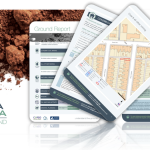 The Terrafirma Ground Report translates the risk from mining activity, subsidence, sinkholes, radon, fracking, mineral planning activity and much more. It also includes Terrafirma’s official CON29M report, as well as never-seen before data and technology driven solutions to analyse the potential impact of man-made and natural ground perils on property transactions. Dynamic next steps and an industry-leading professional opinion ensure the purchaser is fully informed and report terms are comprehensively transferred from the solicitor to the experts at Terrafirma.